I believe Apple TV 4 also has a universal power supply unit as seen from the photo of bottom of the ATV4 US Set taken from ifixit teardown. Model number A1625. 100-240V 50-60Hz 1A. the voltage supports 110-220v !!! RMB 20 at max..... IMO only... don't quote me. Is it available in Epi etc? Or just online? than to get it on day 1 but see those stuck up faces. In apple sg site you can see 'in the box' that siri remote is included, it could be bad advertising if its not. cant wait for reviews here for those 1st owners. 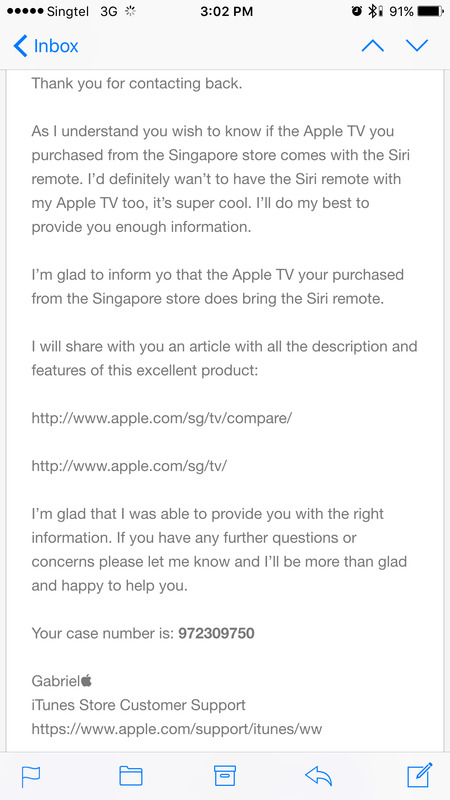 I am very sure Apple TV 4th Gen (2015) SG set will come with SIRI Remote only with different naming (Apple TV Remote). Both US and SG set will come with the same hardware (ie same Apple TV console and same remote with dual microphone and Siri/Search button). The SIRI functionality is not advertised in SG because iTunes store is not as comprehensive/complete as the US iTunes store or due to some other Movie/TV rights/licensing issue. You will still be able to use the SIRI feature with the local SG set if you log in as US account or set the Apple TV region to US. I see no point getting it from US and bring it back to SG just for the SIRI feature. I believe Apple will roll out the SIRI feature to other countries over time. I don't think Apple is stupid to make 2 different remotes just to piss off customers. I do not think Siri is going to work here. Sg store, Siri cannot work that's all. Do you need a china registered Credit/Debit Card?